FÃƒÆ’Ã‚Â¼r das Workshopwochenende in Hamburg am 29. und. 30. 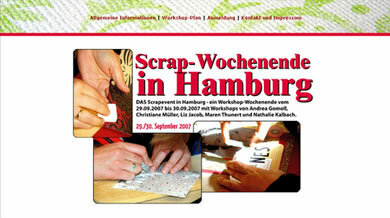 September haben wir noch eine kleine ÃƒÆ’Ã…â€œberraschung – gesponsert werden die Workshops nÃƒÆ’Ã‚Â¤mlich nicht nur von ScrapbookKing, sondern auch von …. For the workshop weekend in Hamburg September 29th/30th we do have a little suprise – the workshops will not only be sponsored by ScrapbookKing, but also by…. congrats! wish I could attend. looks like so much fun! Oh, that’s great, love their colorful papers! :) So looking forward to meet you all! Oooh das ist soo cool!!! Oh Wow, das ist ja klasse. Ich freu mich fÃƒÆ’Ã‚Â¼r alle die hingehen!